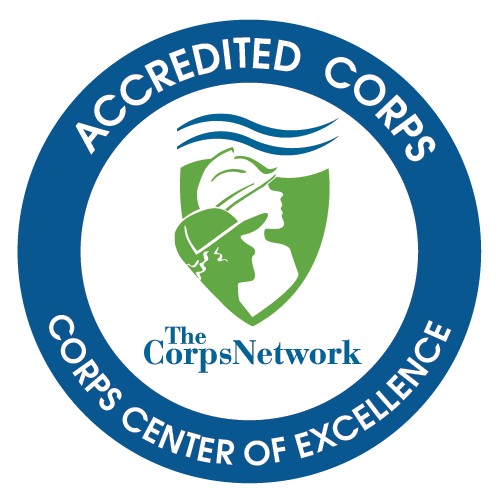 Idaho Conservation Corps is a state wide program of Northwest Youth Corps. Northwest Youth Corps (NYC) was started in 1982—during a tough economic period—with the mission of helping youth and young adults to learn, grow, and experience success. Since that time, NYC has helped 17,000 diverse young people benefit from education, leadership, empowerment, and challenge, while completing high priority resource management objectives across the state. Annually NYC crews carry out 180,000 hours of projects such as invasive plant removal, riparian planting, stream restoration, fence construction, and trail maintenance for a variety of federal, state, and local partners. Idaho Conservation Corps offers a challenging education and job-training experience that helps youth and young adults from diverse backgrounds develop the skills they need to lead full and productive lives. Our core purpose is to provide opportunities for youth and young adults to learn, grow, and experience success. Our programs focus on education, challenge, community, leadership and empowerment, giving youth critical life skills and confidence. Programs stress teamwork, inclusion, and leadership while promoting a solid work ethic and individual achievement. Youth leave Idaho Conservation Corps knowing that they can overcome obstacles, solve problems, make friends, and attain their objectives in life. Emma Stammer, State Manager, EmmaS@idahocc.org - Emma returned to the Northwest Youth Corps and Idaho Conservation Corps family after serving as an AmeriCorps member with NYC's first run of the Community Conservation Corps (now known as NSC/ISC) in 2014. That sparked her AmeriCorps journey and she went on to serve two terms with the City of Vancouver Urban Forestry and Friends of Trees. Passionate about hands-on learning and community involvement, she has worked as an environmental educator and volunteer coordinator. After living in Oregon, Washington and Alaska, Emma found her way to Idaho and ICC. When not working, she enjoys hiking, drinking coffee and tending to her composting worms. Kait Lemon, Panhandle Coordinator, Kaitl@idahocc.org - Kait began her conservation corps career as a Crew Leader in Oregon, and then in Washington, with the Northwest Youth Corps. After a year in Colorado working as a Wilderness Ranger with the Forest Service, she returned and joined the Idaho Conservation Corps crew as a Woodsboss. A former field biologist, Kait earned a Bachelor of Science degree in Natural Resources Management and subsequently worked as a wildlife biologist in Costa Rica, Hawaii and Montana, and as a field ecologist in Michigan. Kait also works as a graphic designer for her family’s business, and has worked as a restaurant manager and professional photographer to fuel her ski bum lifestyle at resorts in Colorado. A wandering dreamer and explorer of adventure, Kait spends her free time making music, backpacking, snowboarding, paddle boarding, and fire hooping. She also has a dog named Lexi, who is her hero, and her role model for life. Alex Cravener, Program Coordinator, AlexC@idahocc.org - Alex grew up in Phoenix, Arizona and now calls Boise home. Her love for nature flourished in Flagstaff, where she received a Bachelor’s of Science in Biology. Her interests led her to work on trails, plant/animal conservation, and management all over the Western United States. She began her career with ICC as a crew leader, and is now excited to share her knowledge as a Program Coordinator. In her spare time Alex enjoys cycling, camping, whitewater sports, and petting dogs. Dan Schillo , Program Coordinator, DanS@idahocc.org - Dan’s passion for the outdoor stems from his upbringing in the rolling hills of Central New York and family camping trips to the Adirondack Mountains. This passion for the outdoors and adventure brought him, as it has so many others throughout history, to the West where he explored from the Redwoods of Northern CA to the Rockies of Montana. It was in Montana that he discovered the conservation corps world with the Montana Conservation Corps in 2012 and stayed until 2014 . This experience had brought him to Idaho on several different hitches and so resulted in a stint as a Wilderness Ranger in the Frank Church River of No Return Wilderness. Most recently he served as program coordinator for Sierra Nevada Journeys an outdoor education campus in the Eastern Sierras. However it was the combination of conservation, community, and service that brought him back to Idaho with the Idaho Conservation Corps and he couldn’t be happier. A perfect day for Dan includes wandering through mountains with a backpack, stories by a campfire, and a hot cup of tea. Feel free to reach out with any questions you may have or just for a good story!